I thought it would be fun to teach Java while I make a video game. This is a simple game, but it will teach a lot of the logic needed to make your own game. I hope you like it. 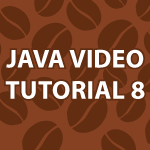 If you missed the previous parts though you should check them out first here Java Video Tutorial. I reference an article on how to install java libraries, in the video below. You can also find all of the code after the video. First of all thanks alot for the awesome tutorial, probably the best one and you have my support. i completed upto this tutorial. i done exactly all the steps and i am getting the same output as of 20:45 but all the “-” and “|*|” are in next lines so i am not getting the same pattern. I figure it out what was the mistake… i put println in the following two places. Thank you very much.. keep up your good work. Love the your tutorials! Is there a single file with the source code I could download? I use geany as my editor. Do I have to use eclipse or netbeans instead? There is no such thing as a stupid question. I created a multidimensional array named battleBoard. To get the length or size of the second part of the array I have to follow battleBoard with . Does that make more sense? 1. In the LessonEight class I commented out the import org.apache.commons.lang3.ArrayUtils line because I don’t have it but the program runs fine without it. Have you actually used any of these utils yet? If so where? I’m not using an IDE just a text editor and a command line Window. 2. If one does use such a set of utils will the compiled program run in a standard environment ( without the apche stuff)? 3. Why does MonsterTwo class have a main function? I like your videos but it takes time to fully digest some of them. Thanks! commented out. Is that a mistake? Does everything from this.health = health; TO numOfMonsters++; fit under the first connstructor? I would like to know how you used the object Monster in main method without creating it or can we use classes directly in place of objects? MonsterTwo Monsters creates an array of MonsterTwo objects. It is named Monsters. Does that help? I didn’t quite get it. The MonsterTwo class is not defined as an array. How is that you are able to directly create a array of it? It is an array filled with MonsterTwo objects. Feel free to skip parts 8 and 10 of this tutorial series. I was experimenting with an idea, but I don’t like how it came out. I’m very happy with the rest of the tutorial though. Congrats you have now replaced the kind lady from India (Prop. Calc. videos) as my favorite internet personality. Just playing around with your code a bit, and I added the ability when using the default constructor MonsterTwo() to display the first letter of the name on the board. As is (at least in the video) this don’t be a happening. But a little of “The joy of Cut and Paste,” and BAM!! Show me the ‘B’ 🙂 Anyway thank you for the time and effort. I have been using my old textbook for a review, and as a guide in my plan to help my brother (he has 1301 in fall), and this is 10^(you pick) times better! I plan on watching all your videos over the next 90 days…It’s Java Boot Camp!!! …An array of objects? Who wouldn’t get fired up!!! Thanks for your help ! Enjoying a lot. Sorry, I am a new. what is the use of above array? To represent the game board. Feel free to skip parts 8 and 10 of this tutorial series. I think I pushed this idea to soon. I reexamine logic in programming later in the tutorial. I am having difficulty in understand how MonsterTwo.buildBattleboard(); works. The best thing to do is to skip parts 8 and 10. I was trying to teach a topic that was to advanced using the limited amount of Java I had taught at that point. The rest of the tutorial is good though in my opinion. To improve I have to on occasion experiment with new ideas and parts 8 and 10 were failed experiments in my opinion. I’ve tried copying the commons-lang3-3.3.2.jar and commons-lan3.3.3.2.jar files (those are the ones I could find on their site, they should be the latest version) to the src folder. That didn’t help either. I have been following your java tutorial series heretofore and everything has been going on well. I must say, you happen to be the best java tutor I have followed so far… way2go Derek! But it seems now I am having issues fixing this error I am getting after trying to run LessonEight.java. It says something funny like, “IOConsole Updater – An internal error has occurred.” When I click the ‘Details’ button I get “No more handles.” May you please help me troubleshoot this? That is an Eclipse error that occurs for complex reasons. Take a look at my tutorial on how to install Eclipse for Java. It will sort that out. please i am using netbeans 8.0 and it does not recognize “org.apache.commons.lang3.ArrayUtils;” How do i install it on Netbeans? Great tutorials Derek, thanks so much. Just to be clear on the x and y positions, typically when we draw a graph, x is the horizontal axis and y is the vertical access but I guess when we’re dealing with the battleBoard here as constructed, x is analogous to i, which actually is the rows of the char and Y is the columns. So in other words, on the battleBoard, x actually is the vertical axis and Y is the horizontal. correct? Thank you 🙂 Yes you are correct. Sorry about any confusion that caused. First off tnx a bunch for your excellent tutorials. I have a question regarding the difference between the JRE System Library versions. I tried running it with JavaSE-1.8 and it didn’t work, After some foolin around I tried changing the JRE System Libarary to version 1.6 and it miraculously worked! Any idea as to why it doesn’t work with 1.8? As always….great tutorial!!! I have a question….why did you make the buildBattleBoard() and redrawBoard() methods static? Hi Yusuf, I did that because building the battle bored isn’t something a monster would be able to do. It is a utility method. Feel free to skip parts 8 and 10 of this tutorial series. I cover this information much better later in the tutorial.